RIO DE JANEIRO, BRAZIL – On Saturday, July 13th, the Niterói based band Tereza will be joined by special guests; João Brasil, Secchin, Apollo and Maria Luiza Jobim at Arpoador’s Studio RJ for a night that promises to showcase some of the best emerging indie/synthpop and electronically infused genre mixing music in Rio. Brazilian indie pop band Tereza, press photo. Tereza was formed four years ago by five childhood friends; Mateus Sanches, João Volpi, Sávio Azambuja, Rodrigo Martins and Vinícius Louzada. They choose the name Tereza in honor of another childhood friend, a girl they thought was one of the prettiest in school. The band is also often referred to as Banda Tereza (Tereza Band) to avoid confusion. Varied musical influences which include 1980s brit pop, funk Carioca and 2000s indie rock, come through in their sound which is a an infectious mixture of pop and indie partly fueled by electronic elements and driven by Brazilian rhythms. “We want to confuse,” they told G1 Globo in an interview earlier this year in which the band also spoke about their video for their song, “Sandau“. Released as a single from their second full-length album entitled, Vem ser artista aqui fora (Come out here to be an artist), the innovative “Sandau” features video clips of the performing band members pasted into google map photos. It was somewhat of a viral hit with over 200,000 YouTube views during its first two weeks online. DJ/composer João Brasil, photo by I Hate Flash/press. In 2012 the band also won the experimental category in The Prêmio Multishow de Música Brasileira (The Multishow Brazilian Music Award). 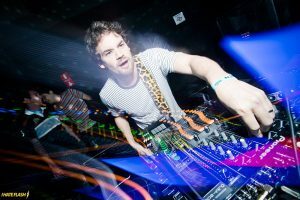 Joining Tereza on Saturday will be Rio musician-DJ-producer-composer João Brasil. Influenced by Carioca funk, tecnobrega and pop music, Brasil is a lover of remix and pop culture. In 2010, Brasil began the ambitious “365 mashups project” where he created one mashup per day and posted them to the project’s blog. As a DJ and producer he has officially remixed major artists including Curitiba’s Bonde do Rolê and São Paulo natives CSS. As a performer, he uses a laptop and MIDI controllers, one of which is usually worn strapped and hanging from around his neck. Also joining the show on Saturday will be; Apollo, Maria Luiza Jobim and Julio Secchin, who produces his music under his last name alone. All three artists have previously worked together and blend indie pop with electronic elements. Jobim and Apollo are featured artists on Secchin’s upcoming EP release. Apollo also recently released his first solo single “Taste Of Your Lips“. Jobim, daughter of Brazilian music legend Tom Jobim, provided vocals for Secchin’s first single “Night Lights” and also performs with Lucas Paiva in the Rio based band, Opala. The duo released their first EP in early June of this year.